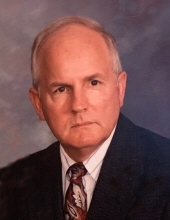 James Leon Bruce, 77 years old, husband to Carolyn Hunter Bruce, passed away at his home on Thursday, December 27, 2018, surrounded by his family. He was born January 29, 1941 to the late Berry and Eunice Hornbeak Bruce in Belzoni, Mississippi. James, while in the Army, was stationed at Fort Lewis Washington. He graduated from Delta State University in Mississippi, was a member of Dry Run Baptist Church, a member of Mt. Vernon Lodge #14 and a Kentucky Colonel. James was a Manufacturers' Representative, and during his time as a Salesman won many awards for Outstanding Sales. He never met a stranger and was truly gifted when speaking with people, and because of this he maintained many lifelong friendships. He enjoyed UK football and loved bluegrass music. James loved his grandsons, enjoyed watching them play sports and spoke about them with everyone. In addition to his wife, Carolyn, whom he loved and was married to for almost 54 years, he is survived by his daughters, Hope Purvis (David) of Frankfort, Kentucky and Candy Bruce of San Francisco, California, twin grandchildren, Cameron Purvis and Connor Purvis and his sister Eunice Roye (Charles) of Pontotoc, Mississippi. He also had several nieces and nephews that were special to him. He was preceded in death by his brother Thomas Bruce. Visitation for James will be Friday, January 4, 2019 from 10:30 am until time of service at 12:30 pm, all at Tucker, Yocum & Wilson Funeral Home. Chaplain Rick Snyder will be officiating the service. Burial will be at 2:30 pm at Camp Nelson National Cemetery in Nicholasville, Kentucky, with Military Honors. Family will service as pallbearers. The family would like to give Special Thanks to Bluegrass Navigators (Hospice) for their exceptional care and a Special Thanks to Linda Habern, his personal caregiver, provided by the VA.
To send flowers or a remembrance gift to the family of James Leon Bruce, please visit our Tribute Store. "Email Address" would like to share the life celebration of James Leon Bruce. Click on the "link" to go to share a favorite memory or leave a condolence message for the family.